Product Consist: Personalized Brother Name Handcarved Rakhi Made out of Metal (Maximum 10 Letters only). 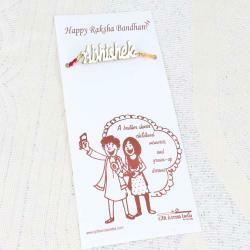 Giftacrossindia.com presents Personalized Name Rakhi for Brother to anywhere in India as well as in World. A Simple look with creative work of alphabetic theme rakhi for your stylish brother with mauli thread will give a special personality to him at this festive season. Add special sweetness through your blessings on this pure relationship occasion with this memorable Rakhi gift. 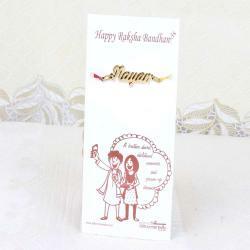 Product Includes: Personalized Brother Name Handcarved Rakhi Made out of Metal (Maximum 10 Letters only).